New Zealand, 1862, Queen Victoria "Chalon Head", 3d brown lilac, imperf, Large Star watermark, corner margin single (R. 1/12), unused with trace of o.g., large to huge margins, beautiful warm color, a Superb gem. Scott No. 13. Campbell Paterson No. A3a (1). SG No. 40 £600 ($790). ONE OF THE FINEST MINT EXAMPLES OF THE 1862 3D BROWN LILAC IMPERF ISSUE. 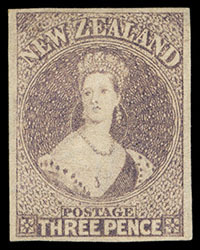 New Zealand, 1862, Queen Victoria "Chalon Head", 3d brown lilac, imperf, Large Star watermark, disturbed o.g., plate flaw showing spot of color on left side of bodice (R. 14/3), extra large margins all around, strong color, Extremely Fine and choice. Scott No. 13. Campbell Paterson No. A3a (1). 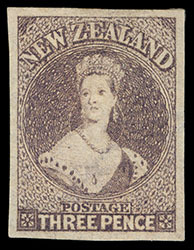 New Zealand, 1862, Queen Victoria "Chalon Head", 3d brown lilac, imperf, Re-entry (R. 2/11), Large Star watermark, unused with small part o.g., full to mostly large margins, deep rich color and strong impression showing burr rubbing at right, Very Fine and rare re-entry variety, Joseph Hackmey, Spink Shreves, May 2010, lot 2162. Scott No. 13 var. Campbell Paterson No. A3a (1). SG No. 40 var. £600 as normal ($790). 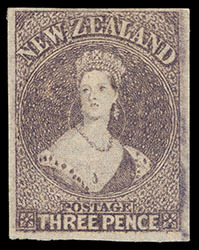 New Zealand, 1862, Queen Victoria "Chalon Head", 3d brown lilac, imperf, Plate Flaw (R. 12/8), Large Star watermark, o.g., hinge remnant, color connecting top of "T" and "H" of "THREEPENCE", large even margins all around, bright color, Very Fine and rare variety. Scott No. 13 var. Campbell Paterson No. A3a (1). 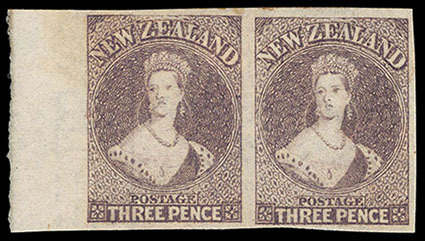 New Zealand, 1862, Queen Victoria "Chalon Head", 3d brown lilac, imperf, Large Star watermark, left margin pair (R. 8/1-2), selvedge with letters "PO" of "POSTAGE" watermark, traces of o.g., some trivial gum staining at top, large to huge margins, deep rich color and strong impression, otherwise Very Fine and attractive pair; with 2003 B.P.A. certificate. Scott No. 13. Campbell Paterson No. A3a (1). SG No. 40 £1,200 as singles ($1,580). 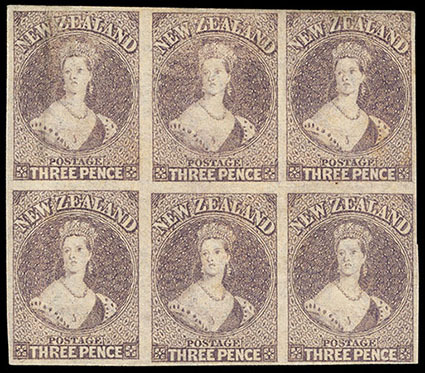 New Zealand, 1862, Queen Victoria "Chalon Head", 3d brown lilac, imperf, Large Star watermark, block of 6 (R. 12-13/4-6), o.g., large margins all around, strong color, vertical crease affects left pair, otherwise Very Fine, Maurice Burrus, Robson Lowe, July 1963, lot 119. Scott No. 13. Campbell Paterson No. A3a (1). SG No. 40 £3,600 as singles ($4,730). A BEAUTIFUL AND EXCEPTIONALLY RARE MINT BLOCK OF THE 1862 3D BROWN LILAC IMPERF ISSUE. Joseph Hackmey, Spink Shreves, February 2009, lot 1117; with 2006 Odenweller and 2007 R.P.S.L. Certificates. Scott No. 13. Campbell Paterson No. A3a (1). SG No. 40 Estimate $2,000 - 3,000. THE EARLIEST RECORDED EXAMPLE OF THE NEW 10D RATE TO THE UNITED KINGDOM VIA MARSEILLES THAT CAME INTO EFFECT SEPTEMBER 1, 1863. 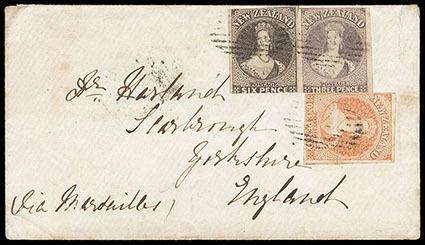 A Postal Notice dated September 1st 1863 (N.Z. Gazette, September 12) gave details of the proposed change of the rates via Marseilles with the charge being increased to 10d. With regard to letters sent to the U.K., these should be brought in "as early as possible". This cover is prepaid with the usual 3d and 6d values, but with a Richardson 1d issue added to make up the new 10d rate. Joseph Hackmey, Spink Shreves, February 2009, lot 1191; with 1979 R.P.S.L. certificate. Scott No. 13. Campbell Paterson No. A3a (1). SG No. 40 Estimate $1,000 - 1,500. A RARE AND MOST ATTRACTIVE FRANKING FOR THE 9D RATE TO THE UNITED KINGDOM VIA MARSEILLES. Whilst the additional French rate of 3d. per ¼oz. was introduced on March 27th 1857, it was not until January 1st 1863 that a 3d value postage stamp was available. Nine months later, on September 12th 1863, the French rate of 3d was changed to 4d for ½oz. letters. Use of the 3d. value for its intended use was therefore very short lived and covers in this period are comparatively rare. References: Illustrated in Odenweller as fig. 5.14, p. 83 and fig. 18.4, p. 255. 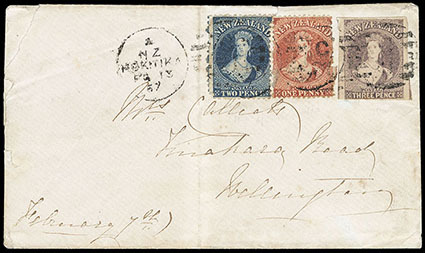 New Zealand, 1862, Queen Victoria "Chalon Head", 3d brown lilac, imperf, Large Star watermark, enormous margins except close at bottom, used with 1d carmine-vermilion, perf 12½ (110) and 2d deep blue (114), all tied by barred oval duplexed with "Hokitika, FE 13 67" cds on cover to Wellington; opening tears at left and vertical fold clear of stamps, F.-V.F. and scarce mixed-issue franking. Scott No. 13. Campbell Paterson No. A3a (1). SG No. 40 Estimate $300 - 400. This letter was prepaid 6d for a ½-1 oz. letter between provinces introduced in January 1, 1867. The perf 12½ 3d in the lilac and mauve shades is first recorded in March of 1867. 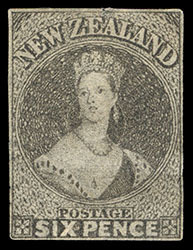 New Zealand, 1862, Queen Victoria "Chalon Head", 6d black brown, imperf, Large Star watermark, part o.g., clear even margins, strong deep color, small fault at top center, F.-V.F. 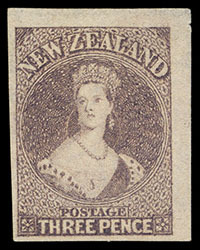 appearance and scarce unused stamp. Scott No. 14d. Campbell Paterson No. A5b (1). SG No. 41 £2,000 ($2,630).